What is Imigran used for? Imigran is a medicine specifically used to relieve migraine attacks. It contains the active ingredient sumatriptan, which is a type of medicine commonly known as a triptan. Imigran has a narrowing effect on blood vessels in the brain, which helps reduce or eliminate headache and other migraine symptoms. Imigran is a prescription-only medicine. Imigran is used to treat migraine, a type of headache that involves severe pain, usually to one side of the head, nausea and sensitivity to light and sound. The onset of a migraine may be preceded by an aura: visual disturbances such as flashing lights, stars or zigzag patterns. Migraine episodes can last a few hours up to several days. 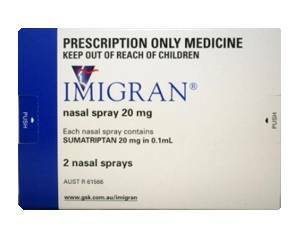 Imigran is available as tablets and nasal spray. Each nasal spray contains one dose and is for single use only. See the package leaflet for step-by-step instructions for use. The tablets should be swallowed whole, without chewing, with some water. A dose of Imigran should be taken as early as possible after the migraine headache has started and will start to work after about 30 minutes. Imigran is not effective in preventing a migraine headache from occurring. Adults between the ages of 18 and 65 years: one 50-mg or 100-mg tablet at a time. Repeat if necessary. Do not take more than 300 mg in any 24 hour period. Adults between the ages of 18 and 65 years: one 10-mg or 20-mg dose in one nostril. Repeat if necessary. Do not use more than two nasal sprays in any 24 hour period. Children aged 12 and above: one 10-mg nasal spray in one nostril. Sensation of tightness or pressure in any part of the body, including the chest and throat. If feelings of tightness or pressure continue or are particularly severe (especially chest pain), you should tell your doctor immediately. You are taking certain antidepressants or other migraine medicines. Consult a doctor on the use of Imigran if you have a health condition that is not listed above, are taking medication, smoke cigarettes or are older than 40 years of age. Imigran should not be used by pregnant or breastfeeding women without consulting a doctor first. Imigran may cause dizziness. Do not drive until you know how the medicine affects you. Alcohol is a migraine trigger. Avoid drinking alcohol shortly after a migraine attack.